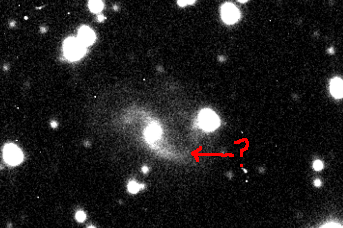 Supernova 2013eV - Now you see it, Now you don't! 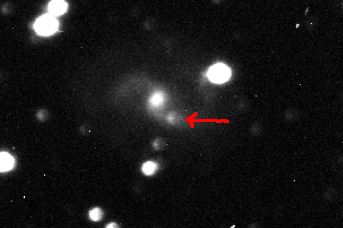 The sequence of images in "Deep Sky Objects" shown below was published without recognition that a supernova had appeared during the published study. These images detail the before, during and after appearance of the star field. All the images are quarter-cropped from the SBIG, ST-8 images take on a Celestron C14 telescope operated at f10. 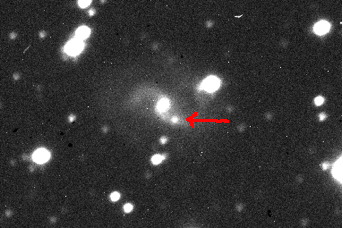 The first image shows IC1296 recorded for 1000 seconds on 8-6.1434-2013. 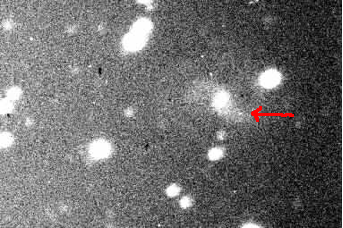 The arrow points to the pinprick of light that is in the process of blossoming into SN2013ev. IC1296 recorded for 1000 seconds on 8-10.0999-2013. It's a lot harder to miss here! IC1296 recorded for 1000 seconds on 8-10.1154-2013. IC1296 recorded for 1000 seconds on 8-10.12909-2013. IC1296 recorded for 1000 seconds on 8-10.16785-2013. IC1296 recorded for 11 each of 100 seconds on 8-21-2014. One year later no detectable optical signal remains at this level of detection.